Today, I am so excited to present our first giveaway present. I am even more excited because we are giving away for free 2 bottles of a great skin care product which is HYKO Hyaluronic & kojic acid brightening serum. Kojic acid is a natural skin brightener which doesn’t irritate the skin like hydroquinone which is banned in the European Union countries because of its negative and risky side effects. HYKO contains high quality natural and organic ingredients and its sales support a sustainability project taking place in the heart of the Amazon rainforest. You can of course read more about HYKO brightening serum on the link above where you can find my full and detailed review of the product, but now let me give you more details about how you can win these free giveaways. First condition is that you are a US citizen. Sorry for the rest of you people, hopefully another giveaway will include more countries. Second and last condition is that you tell us about your favorite skin care habit, a skincare tip that you swear at or even something that you don’t like and you would like to change in your skin care routine and send it to us through the contact form section you can find on the site. So, all you have to do is click contact, write whatever you want to say (no limit in the words) and send it to us with your name and surname. After we select all of your messages, we will pick up the two we like the most. If we can’t choose, because there will be a lot that we like, we will run a lottery. The 2 winners will be announced with their names on the site in the end of May or beginning of June 2015 and will be personally contacted through their email to be given the coupon codes of 100% discount and free shipping if they choose the 2 day shipping from Amazon. 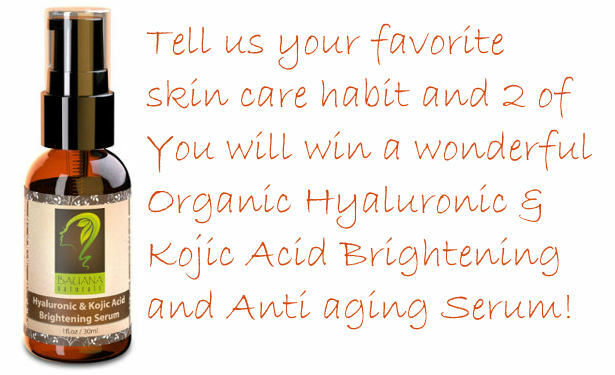 So, hurry, send us your comment and you might be one of the two lucky people to win this wonderful natural and organic hyaluronic and kojic acid brightening serum.